We hear a lot of talk about the benefits of a social media presence, but we speak less often about the downside. However, like every marketing activity, social has the potential to sell a product, or to put across a message and it also has an intrinsic risk. The risk on a traditional TV campaign is different to social. Unless a brand is being deliberately controversial, it's unlikely that you'll badly offend anybody with your thirty seconds of exposure and so the risk is in the budget that you commit to TV. You spend millions buying airtime and give up another slice of your budget to film the ad and you risk that it doesn't work; that it doesn't prompt people to go out and actually buy the product. We tend to think that this risk is pretty low and as long as your ad reaches some minimum quality, it will at least work a little, just by getting the brand name in front of people. So what about social media risk? You don't usually commit such large marketing budgets to social and so the risk seems low. You might as well have a social presence - what is there to lose? On a risk vs. reward basis, there's potentially a great deal to lose. 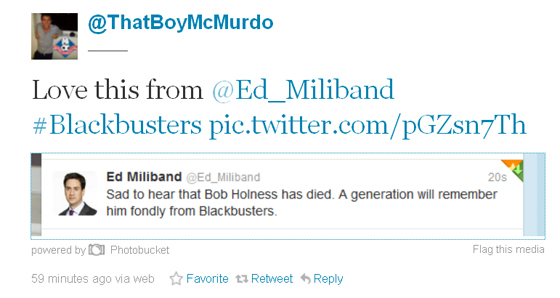 Ed Miliband's having a bad afternoon on Twitter. Somebody (and a staffer in his office seems to be taking the blame rather than the man himself) tweeted this is response to the death of Bob Holness today. An odd typo, especially as it follows hot on the heels of Labour MP Diane Abbott (@HackneyAbbott) tweeting that "white people love playing divide and rule" and starting a racism row. So, a substantial down-side risk of social media. The risk is heightened by the lack of oversight and care in a tweet, compared to a traditional ad that comes with an invoice attached. There's no way Diane Abbott's comment would have made it into an election leaflet to her constituency for example - or you'd certainly hope not - as a proof-reader would pick up on it and she'd choose her words much more carefully. In the agency recently, we've been revamping our approach to social and one of the key questions for me is should you do social at all?. The answer is not always a simple yes. If you're not going invest serious effort, or are going to put junior staff in charge of the accounts, then social media is mostly a potential risk, rather than a potential benefit. That risk is tough to assess and is similar to what disaster planners call a "high impact, low probability event". The exec you put in charge of the Twitter account probably won't screw up and post something that could be construed as racist. Greenpeace probably won't decide that you're a corporate bad guy and start bombarding your Facebook page. Probably nobody will tell a customer with a legitimate complaint that they're a pain in the neck. Low probability. But if they do, they'll be doing it in public... High impact. Taking risks is fine if there's a potential benefit that outweighs the risk, which brings us back to Ed Miliband. I can't understand why he has a Twitter presence at all. @Ed_Miliband tweets once every couple of days, giving the bland Labour Party line on usually fairly dull topics. For me, there is no way that the @Ed_Miliband account can be doing a great deal of good for Miliband or for Labour. It's just there. Which means it just sits there, generating minimal benefits and waiting for something to go wrong, like it has today. The account it a risk and that's all it is. If your social presence is a "me too", or a vanity project, or in the hands of a junior exec because what could possibly go wrong? Then it might be time to think about whether you should have one at all. Maybe the only thing it's doing is sitting there, quietly, until the low probability event happens that makes you wish it could just go back to being ignored. If we consider that he has about 120,000 followers, about 3% of his followers clicked on the link. Surely not great but better than nothing, would you not agree? Interesting idea to have a look at the clicks he generates. I'll be doing that more in future! It's the balance of risk for me. A few thousand clicks for the leader of the Labour party vs. the risk of getting into a mess he really doesn't need. I'm not sure those few clicks (relatively, I'd be overjoyed with 3.5k clicks!) are worth it for him.